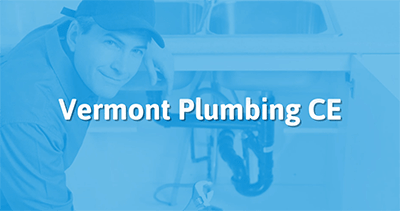 Our Vermont plumbing continuing education course is approved by the Vermont Division of Fire Safety - Plumbing Examining Board to meet your continuing education requirements. Once you complete your course a Certificate of Completion will be available for instant printing. We are the first provider approved by the Division of Fire Safety - Plumbing Examining Board to offer online CE. Enroll now to take your CE with us, At Your Pace Online. Master, Journeyman, and Specialist Plumbing Licensees are required to obtain 8 hours of continuing education.